Correspondence in the collection shows that after Nisonen died Dec. 5, 1946 most of his original manuscripts were in the hands of former students. Only through great efforts in contacting these students did the Finnish American Historical Archive get back many of his music manuscripts. Suomi College presidents and archivists corresponded with former students. They even advertised for the return of this music in Finnish American newspapers. These efforts began in the early 1960s and really took hold with a Nisonen concert in conjunction with the American bicentennial in 1976, and a large memorial concert and scholarly panel in 1982. Some of the more important contributors to the re-gathering of his music were Nisonen's former student, Dr. John Milton Gustafson, a music professor at the University of Oregon, musicology professor Dr. Ruth-Esther Hillila, and Lempi Auvinen, who allowed her large collection of Nisonen choral music to be photocopied and returned to [Hancock]. Many of Nisonen's omer former students and friends returned music, giving Finlandia the collection it has today. From obituaries and letters in the collection we learn about the Nisonen family. Martti's father was Henrick Johannes Nisonen (b. 1870) and his mother Emilia Dahlstedt (b. 1874). He had a younger brother, Paavo Antero Nisonen (b. 18 July 1896, d. 31 Jan. 1918). His wife was Martta Olivia Nisonen o.s. [Martta Helenius] (b. 2 Oct. 1890, d. 22 Sep. 1942). They married on 15 Aug. 1914 and had four children: Bert Nisonen (b. 7 July 1915, d. Feb 1983), Eiri (Mrs. Robert J. Benson, Bellevue, WA), Sirkku? (Mrs. Ross McPhail, Ontario, Canada), and Henry J. Nisonen (b. 4 May 1927, d. Nov. 27, 1953?, Bellevue, WA). More than 20 years ago there was correspondence with a granddaughter, Marnis K. Holmes and a great granddaughter Sandra-Ann MacEachem, both of Toronto, Canada. Nisonen was very patriotic, for both the United States and Finland. For example, he composed a symphonic poem called "The Vision of Francis Scott Key" based on incidents in die composing of the "Star Spangled Banner." He also composed a cantata tided "Debt," based on Finland's faithfulness in paying its war debt, and a work titled "Pro Patria (Suomen Sankareille) To the Heroes of Finland" dedicated to his brother Paavo. His Symphony in F major, which he completed on June 14, 1945, took him more than six years to compose. The final movement is programmatic and based on the story of how Finland endured the Second World War. It describes ". . .a patriotic young man's visions, fears and hopes..." [for the future]. Nisonen was personally involved in recruiting volunteers from Hancock to fight for Finland in the Second World War. 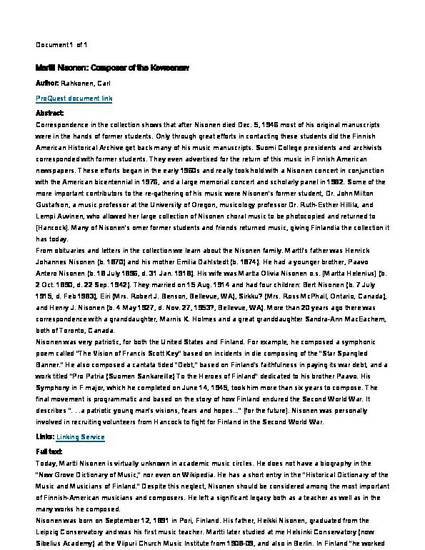 "Martti Nisonen: Composer of the Keweenaw." Finnish American Reporter 27, 6 (June 2013): 4.